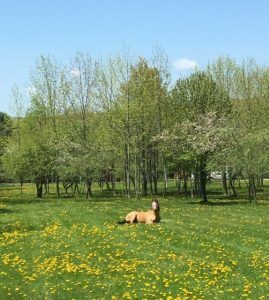 In December of 2017, the MSSPA received two horses in dire need of help. Authorities had been pursuing their owners for several months, as the horses had been living in a trailer and were in bad shape. 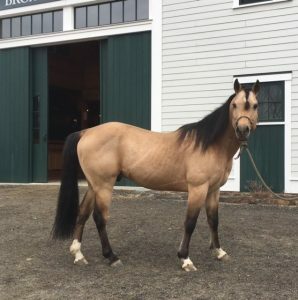 Buck's companion, a mare, was in such poor condition that she had to be humanely euthanized. Buck, a stallion at the time, looked better- perhaps he had not been in the situation as long- but clearly it would take time for the mental trauma of his ordeal to fade. After being gelded and evaluated as a training prospect by the MSSPA, Buck arrived at our farm. At first he was a bit of a handful, mostly in turn out where he would display aggressive stallion-like behavior towards other horses. 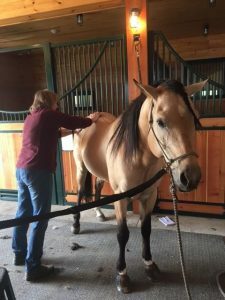 We treated him for ulcers, began a calming supplement, and introduced bodywork (massage) while slowly beginning work in the roundpen and arena. We've found it's well worth the extra time and resources to make sure a horse is feeling good before we ask much in training. Unlike many horses we work with, Buck is very confident. The big challenge with his early training was to keep focus on the handler, as he gets distracted with other horses nearby. 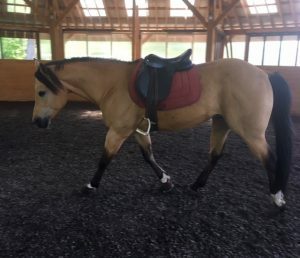 Once we could keep his attention, then we could show him how to use his body more correctly, with emphasis on a nice bend and softening through the topline. As Buck begins to stretch and soften during work, he feels more comfortable and relaxed, which is always the end goal. Daily snooze in the field! As always with our horses, we started at the beginning with Buck. Only after we've spent several months evaluating him have we now begun sitting on his back. We've consistently done groundwork, lungeing, and roundpen work where we began with ropework before moving onto surcingle and saddle. Buck has done all of our obstacles, practiced tying, been bathed, and worked indoors and outdoors. He stands quietly for grooming and the farrier. When you reach that point where most everything has been checked out, then it's time to start riding! We really enjoy working with this handsome boy, and look forward to seeing him progress under saddle.